A major facilitator of the "war" in Iraq who proposed partitioning Iraq into three areas based on ethnicity and religion. Biden has served for decades as the Chairman of the Senate Foreign Relations Committee and bears major responsible for failed U.S. foreign policy stances. News of this appoint spurred a surge in the market on Friday, but it is not encouraging that Mr. Geithner was International Monetary Fund Director in its Policy Development & Review Department. The IMF's globalization agenda and debt and dependency policies have devastated the global south and contributed to the global economic crisis. Also, Geithner worked for Kissinger and Associates, Henry Kissinger's firm. In my opinion, Mr. Kissinger is a war criminal who ordered the "secret" carpet bombing of Cambodia during the Vietnam War. Mr. Orszag was a Senior Fellow and Deputy Director of Economic Studies at the Brookings Institution. "Initially centrist, the Institution took its first step rightwards during the depression, in response to the New Deal. In the 1960s, it was linked to the conservative wing of the Democratic party, backing Keynsian economics. From the mid-70s it cemented a close relationship with the Republican party. Since the 1990s it has taken steps further towards the right in parallel with the increasing influence of right-wing think tanks such as the Heritage Foundation." She voted to give authorization for the war to GWB. She deserves condemnation for her lies about coming under "sniper fire" on tarmac while in Bosnia. Since becoming NY's Junior Senator, she has threatened to "obliterate" Iran. She was a hawk during the tenure of Bill Clinton and encouraged him to bomb Serbia. Obama's fellow alumni of Columbia University (BA 1973 in American History, Obama BA 1983 in Political Science), Mr. Holder represented the Chiquita Corp.
"In 2004, Holder helped negotiate an agreement with the Justice Department for Chiquita Brands International in a case that involved Chiquita's payment of "protection money" to the United Self-Defense Forces of Colombia, a group on the U.S. government's list of terrorist organizations. In the agreement, Chiquita's officials pleaded guilty and paid a fine of $25 million. Holder represents Chiquita in the civil action that grew out of this criminal case." 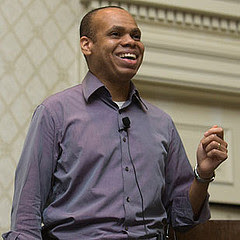 Patrick Gaspard rumored to be next White House Political Officer. Gaspard was the political director on Obama's presidential campaign and associate personnel director for the White House transition team, making the 41-year-old Haitian-American a powerful contact for anyone seeking a job in the new administration. Cautiously hopeful because Mr. Gaspard is a Haitian-American who was until recently the political director of 1199 United Healthcare Workers East (SEIU). He is a veteran campaigner who worked on the Jesse Jackson campaign and former NY Major David Dinkins. He is slated ascend to this influential post which most recently was held by "Bush's Brain" Carl Rove. The AP reports that "Officials said New Mexico Gov. Bill Richardson had emerged as a likely pick as commerce secretary, although he had hoped to be secretary of state." Gov. Richardson also took a pro-war in Iraq position. Another Clintonian appointee, Richardson outed a scientist as a China operative who was later proven innocent. "Richardson publicly named Wen Ho Lee, a scientist at the Los Alamos National Laboratory, as a target in an espionage investigation. Lee was accused of passing nuclear secrets to the Chinese government. Lee was later cleared of those charges and won a settlement against the U.S. government." Senate Majority Leader Tom Daschle of South Dakota as secretary of health and human services. "...worked extensively on the use-of-force authorizations for the attacks on Afghanistan and Iraq, both of which Daschle supported. From 1996 to 1999, McDonough was a professional staff member of the House International Relations Committee during the debate over the bombing of Yugoslavia. More recently, he was at the Center for American Progress working under John Podesta, Clinton's former chief of staff and the current head of the Obama transition." Janet Napolitano, likely to be named as Sec. of the Homeland Security Dept. Arizona Gov. 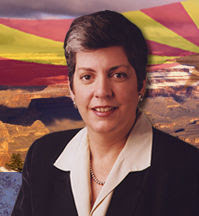 Janet Napolitano, likely to be named as secretary of the Homeland Security Department. Impressed by Napolitano who was named by Time Magazine as one of the five best Governors in the U.S. She served as an attorney for Anita Hill. As a U.S. Attorney and Attorney General of Arizona she investigate the Oklahoma City bombings and she focused on consumer protection issues and improving law enforcement. He has threatened to "capture and kill" Osama Bin Laden... what no due process from the constitution law professor? Last time I checked extra-judicial killing is illegal. This pragmatist's use of such loaded language which seems aimed at stoking the fears and passions of the American people is discouraging. How's that any different from Bush, who used almost identical inflammatory language? Obama wants to send more troops to Afghanistan where they will unavoidably kill more innocents like the Afghan wedding party bombed this month. These poor people had nothing to do with 9-11. Also, he has proposed expanding the "war" into Pakistan without regard to Pakistani sovereignty (more of Bush doctrine and actions). He has allowed the telecoms to slide; he voted to grant them immunity for their illegal wiretapping of the American people. He panders to the Israeli lobby. He does not propose to alleviate the suffering of the Palestinian people or hold Israel accountable for illegal land grabs and oppression of the so-called "minorities". The Palestinians are prisoners in their own country; non-citizens who have no political power; who's democratically elected representatives are targeted by the Israeli gov't for extra-judicial assassination. His very first appointment; Rahm Emmanuel is an Israeli with rumored Zionist ties. His advisors are from the ranks of the Clintonians and neo-cons, and have a history of carrying on America's imperialistic agenda, they include -- Hillary Rodam Clinton, Madeleine Albright, Rahm Emanuel... more here. In an interview with the New Yorker magazine this week, Gaspard related an instantly famous remark Obama made during his job interview with the president-elect. After noting that he appreciated opinionated advisers, Obama told Gaspard: "I think that I'm a better speechwriter than my speechwriters. I know more about policies on any particular issue than my policy directors. And I'll tell you right now that I'm gonna think I'm a better political director than my political director." This Is Change? 20 Hawks, Clintonites and Neocons to Watch for in Obama's White House.